Since its launch in March 2017, the Nvidia GTX 1080 Ti has proved to be one of the best graphics cards ever made for enthusiast gamers – it even earned one of our coveted Best in Class awards. With a huge 11GB of GDDR5X memory, 3,584 CUDA cores and a memory clock of 5,505MHz, it remains one of the most powerful GPUs around. As is usual with GPUs, a number of manufacturers have made their own versions based on Nvidia’s hardware. These often boast additional features, custom designs and improved clock speeds that make small, yet important, differences to the performance of the cards. So, if you’re serious about fitting out your gaming PC with the best graphics card you can currently buy, read on for our list of the best Nvidia GTX 1080 Ti graphics cards in 2017. 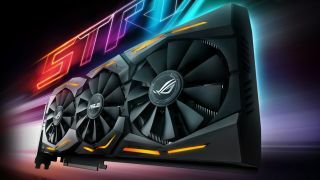 If you’re sticking a powerful graphics card in your PC, then you’ll likely want to shout about it, and the ASUS ROG Strix GeForce GTX 1080 Ti is the perfect choice for people who want to pimp out and show off their rigs thanks to the Aura RGB LED lighting system. It’s not all about the looks, however, as the Asus ROG Strix GeForce GTX 1080 Ti also features a design that keeps the GPU cool even when overclocked, while a dust-resistant fan is another nice bonus. Overall, the Asus ROG Strix GeForce GTX is an excellent package, and the best overall version of the GTX 1080 Ti. Using water cooling to keep your graphics card chilled, and quiet while in use, is very effective – but it's also risky and complicated. The EVGA GeForce GTX 1080 TI FTW3 iCX Hydro Copper makes things easier, as it comes with the waterblock already installed onto the GPU, so you don’t have to remove and replace any fans. You can then hook it up to an existing cooling solution, or use a pre-built setup. The added complexity and price of the EVGA GeForce GTX 1080 TI FTW3 iCX Hydro Copper makes it suitable for only the most accomplished gamers; however, if you want the ultimate in water-cooled power, it's a fantastic choice. The MSI GeForce GTX 1080 Ti GAMING X 11G is another GTX 1080 Ti variant that delivers impressive power while running as cool and quiet as possible. To keep it cool, the MSI GeForce GTX 1080 Ti GAMING X 11G utilises carefully-designed heat pipes that maximise heat transfer, and a lot of thought has gone into the design of the fans, with a steeper curved blade that helps accelerate airflow. It also features MSI’s Zero Frozr technology, which turns off fans when the card isn’t being used under heavy loads. By only using the fans when they're needed, the MSI GeForce GTX 1080 Ti GAMING X 11G runs very quiet – although you pay a bit of a price when it comes to graphical grunt, as this card doesn't run quite as fast as some of the other GTX 1080 Ti cards on this list. Thanks to its power, the GTX 1080 Ti in any form is an excellent graphics card when it comes to virtual reality. However, for VR fans, the Gigabyte Aorus GeForce GTX 1080 Ti Xtreme Edition is the best choice, as it comes with a handy additional front-facing HDMI port that allows you to easily plug in a HTC Vive or Oculus Rift without having to crawl around the back of your PC, while having plenty of ports to display additional footage to connected monitors. It also has some impressive cooling features, including a copper back plate, and the ‘Windforce stack’, which stacks three 100mm fans to help with heat dissipation. This is also one of the fastest 1080 Ti cards in our list. If you’re looking to build a compact and discrete PC for your living room that will blow traditional games consoles like the Xbox One and PS4 out of the water, there really is no other choice if you want to harness the power of the 1080 Ti. The Zotac GeForce GTX 1080 Ti Mini is around two inches shorter than many of the other 1080 Ti cards on this list, yet it doesn’t compromise on performance. This means it’s easier to fit the Zotac GeForce GTX 1080 Ti Mini into small form factor PC cases. However, there have been some compromises made to create such a small GPU. Specifically, because of the small size, Zotac hasn't employed as advanced cooling solutions as on other GPUs, so the Zotac GeForce GTX 1080 Ti Mini runs hotter than other cards. Because of this the fans will kick in more often, and as they're smaller they produce more noise. Still, if size and power are all that matter, the Zotac GeForce GTX 1080 Ti Mini is an excellent choice.